Death Penalty was born on the ashes of Cathedral. The rumor has it that Cathedral vocalist Lee Dorian, him also the owner of Rise Above Records, told Cathedral guitarist and Death Penalty mainman Gaz Jennings that as long as Gaz had the riffs for his new band Lee would give him the deal. 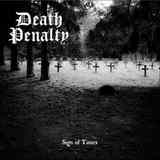 Eponymous full-length release right around the corner, the 7” single Sign of Times offers a glimpse of what Gaz considered was the material worthy of the showcase/glimpse into Death Penalty. The opening tune Sign of Times does offer a pair of those grumbling riffs, but they are far from being iconic. Cathedral, after all, was a stalwart institution, while Death Penalty, at least on Sign of Times, seems like what was a leftover material, which did not make it into the Cathedral latest releases. Equipped with dirty-via-production, but otherwise non-descript, bottom end, Sign of Times is semi-catchy, but bulky and plodding. There is an improvisation solo thrown in here, but it does not rescue the lack of interesting songwriting. B-side Seven Flames is livelier, a bit more up-tempo, and even breaks into a gallop mid-way, all with the same dirty sound. Michelle Nocon (from Belgium’s Serpencult) was recruited to sing for Death Penalty, but I can’t say I was impressed with her vocals. Maybe it is where she is placed in the overall mix, but her voice just does not seem to be strong enough to carry over the riffs. US Benedictum Veronica Freeman or A Sound of Thunder Nina Asegueda would have made these songs shine much brighter. I can only imagine how the bridge on Sign of Times would have stood out if either of the two aforementioned vocalists were to deliver it. Including two rather different songs on the single was supposed to be a way to announce the breadth of the new band, but I notice that full-length does not include either of them. Maybe the single caught me on the off day, and full-length will be so much more powerful and attractive. I invite you all to get the full-length and share in the opinion.